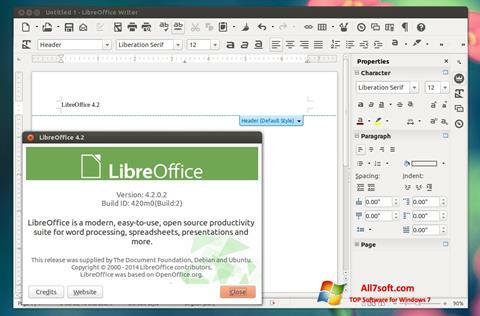 LibreOffice for Windows 7 - Office suite open source. The program includes a text and spreadsheet editor, a tool for creating presentations, tools for working with graphics, calculating mathematical formulas, managing external or own HSQLDB databases. All modules of the application provide end-to-end integration with each other, support the technology of simple dragging and dropping objects, use common analysis and calculation tools. The program can work with documents of other office suites, allows you to use third-party extensions and dictionaries to check grammar. You can free download LibreOffice official latest version for Windows 7 in English.